Q. What ages are appropriate for Birthday Parties at Jump Start Gymnastics? A. 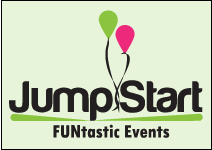 Jump Start Gymnastics Birthday Parties are appropriate for children ages walking-12. We adjust the activities based on the age of the birthday child or activity group. We have a Totally Toddler Gym available for birthdays that have participants mostly 3 & under upon request. Q. How many total children are included in the party? A. 10 kids are included in the base cost of the party. You may have up to 24 children total. Q. Will my party have a party host the entire time of my party? A. Most definitely! Your party host is with your party from start to finish. Your party host is there to greet your guests and will lead your party with a variety of fun games and activities. Your host will set-up your party room, serve your guests, and assist you in any way possible to make your party the ULTIMATE birthday party experience! Your host will take care of all the clean-up and even assist you in carrying your gifts to the car if needed! Q. Am I allowed to tip the party host? A. Tipping is appreciated but not at all expected. However you can tip if you feel the party host has given outstanding service and helped to make your party run smoothly. Q. What type of food is allowed at the birthday party? A. Jump Start provides (free of charge) a ¼ sheet cake from Trefzgar's bakery & lemonade for the guests. You may request a larger cake for an additional fee. We do not recommend bringing outside food in other than ice cream because of the limited amount of time in the party room. Q. Can we serve alcohol for the adults? A. Because our birthday parties are for children, there is no alcohol allowed. Also, there is no smoking permitted anywhere on the premises. Q. How early should we arrive for the birthday party? A. We suggest you arrive about 10-15 minutes prior to your scheduled birthday party time. This will help you in collecting the waivers and any last minute instructions to the birthday host that may be necessary. If you should arrive too early, your party may need to wait in our lobby. Your birthday party will start on time, so please remind your guests to arrive on time. A. Jump Start Gymnastics supplies you with a digital invitataion personalized for your birthday child & party! Q. What should guests wear to the party? A. Your guests should wear comfortable clothes – t-shirt with shorts or a leotard if you have one. It's best not to wear anything with buttons, buckles, zippers, belts or rivets. Also, please remove all jewelry. If your guests have long hair, it needs to be put it in a ponytail if possible. Q. Will I be charged for infants or adults attending the party? A. No, infants and parents are considered spectators at the party. They are to remain in the lobby area and not in the gym during the first part of the party. However, they can participate during the last portion of the birthday celebration when the group moves into the party room. Q. Will I be sharing the gym with other classes or parties? A. There could be another party in our building at the same time. However, the other party will be in a different area. Q. What do I need to do to reserve my party? A. All of our packages require a nonrefundable $50.00 deposit. This deposit is applied towards the total cost of your party. The balance of your party package is due at the end of the party and is based off of the number of participants that attended. A. Unfortunately, deposits are not refundable. You may cancel your party and use the deposit money toward tuition, merchandise, or any special event. You can even reschedule your party! Q. What if I need to change the date of my party? A. No problem. A party date can be switched provided we have a date available for you.